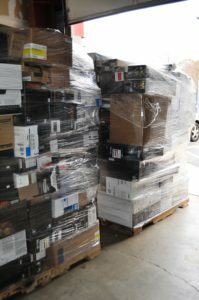 We recycle a staggering 12 tons of printer cartridges per year. Every cartridge, printer, part and packaging material used to support your print output fleet is automatically put into our recycle programs. As a customer of Laser Line, you automatically receive our recycling services at no charge to you. We’ve Been Green Since 1989! We recycle a staggering 12 tons of printer cartridges per year, resulting in a reduction of over 10,000 cubic feet of landfill waste. And it gets even better! When we count the volume and weight of the printers we recycle every year, it adds up to an amazing 20 tons of recycled printers and supplies, and a reduction in landfill waste that tops 30,000 cubic feet! We also recycle spent drum cores, fuser roller cores and complete printer units. 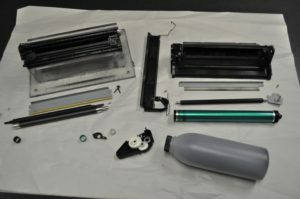 Once we pick up your old printer and break it down, the individual metal and plastic components are sent downstream to our recycling partners. Keeping machines running and reusing toner cartridges has been the cornerstone of our business philosophy — before it was cool! With all the talk about going “Green” and living responsibly on this planet, you would think it to be a new idea or at least the latest fad. Many of us have been participating in sensible living for many years. Recycling has been a part of what we do at Laser Line from the time we started. When I saw my first Laser Printer at C & P Telephone back in the early 80’s, I thought it such a waste to throw away such an expensive piece of gear as an empty toner cartridge. From that point on I kept my eyes open for a way to do things differently. Since 1989 our customers have saved nearly 250,000 toner cartridges from an early landfill death and been responsible for saving oil, (the major portion of a cartridge is plastic) aluminum, cardboard and other resources from being disposed of before their useful life is up. The waste we as busy Americans generate is staggering. But when caring people decide there is a better way, we make a huge impact. To our customers who use our full circle programs to support their printer fleets we say a “Big Thank you.” Not only for your business but also for generations of people who are environmentally impacted by the decisions you make today. We talk about “full circle” in the sense that it’s nice to throw things into recycling containers but unless we also buy and use those products when they are put to market, there is only waste involved and no recovery benefit. As Maryland’s largest Print Management and HP Printer Service Provider we are able to team up with our customers to bring quality products to market that rival original equipment and provide savings and our Value Added Service. By repairing machines rather than throwing them in the dumpster for nothing more than a minor problem, we all benefit. By using Preventative Maintenance as a cornerstone of our management program we keep machines running longer and stronger than many people would ever have imagined. We service on a regular basis machines that are over 15 years old, which have printed millions of pages in their lifetime. If your concern is for the environment as well as economics, without compromising quality of print or machine functionality, let us show you our “Full Circle” programs that benefit you and the environment every day. Our thanks for your business and the difference you make in your corner of the planet. Check out our newest partnership – PrintReleaf!